This Spotlight is sponsored by Canon. 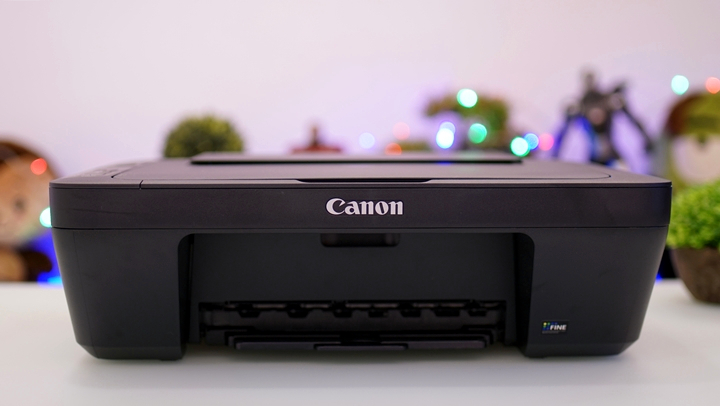 Need a new, efficient printer to kick-start 2019 with? 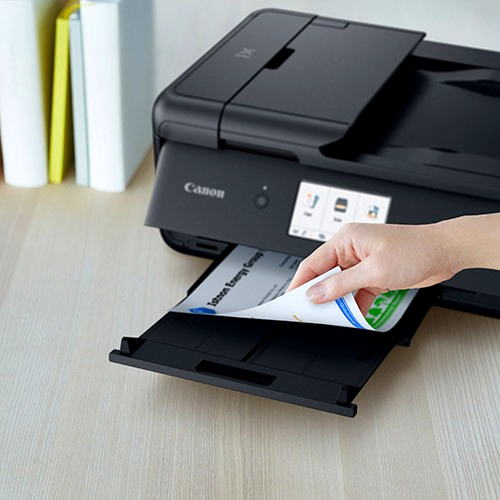 Their Ink Efficient E & G Series printers are designed to give you an affordable wireless printing experience, enabling you to print your things easily. 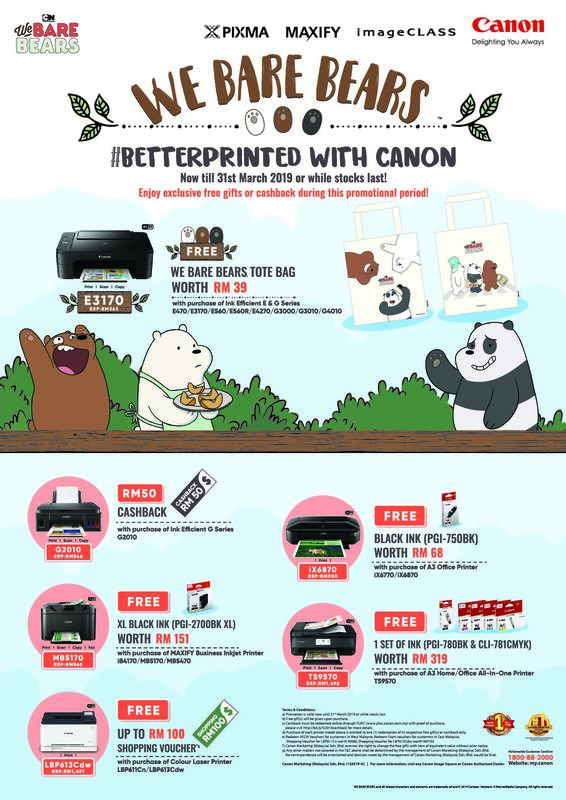 There's no doubt that these printers are extremely efficient, but perhaps the best part about purchasing them now is that Canon will be giving away FREE WeBareBears Tote Bags with purchase of any Ink Efficient E & G Series printers! What’s not to love about the adorable Grizzly, Panda, and Ice Bear of WeBareBears? If you’re a fan of their cute and clumsy nature, you can now carry them with you everywhere you go! PIXMA E470 - This Ink Efficient printer is designed to give you an affordable wireless printing experience at low running cost of up to 400 pages. PIXMA E3170 - A compact wireless all-in-one printer that comes with an LCD screen. 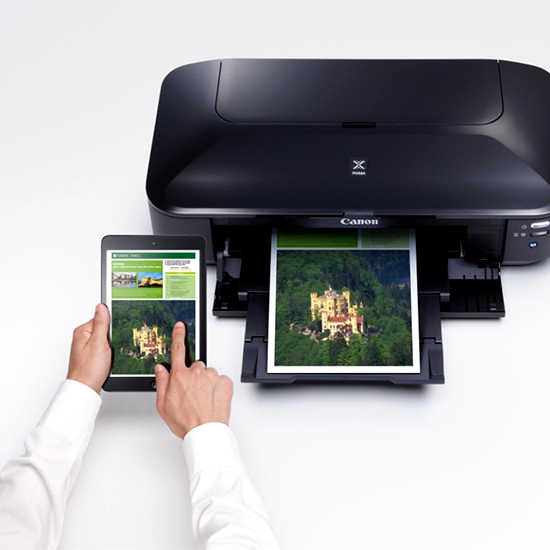 PIXMA E560/E560R - Print up to 800 pages with this affordable wireless printer. PIXMA E4270 - This compact printer features a 20-sheet Auto Document Feeder for productivity and is able to print up to 400 pages. PIXMA G3000 - A refillable ink tank wireless all-in-one printer that's perfect for high volume printing. PIXMA G3010 - This refillable ink tank printer that has hi-speed USB 2.0, WiFi, Mopria, and Access Point Mode. PIXMA G4010 - This refillable ink tank printer that has hi-speed USB 2.0, WiFi, Mopria, AirPrint, Access Point Mode. This printer is able to print, scan, and copy. 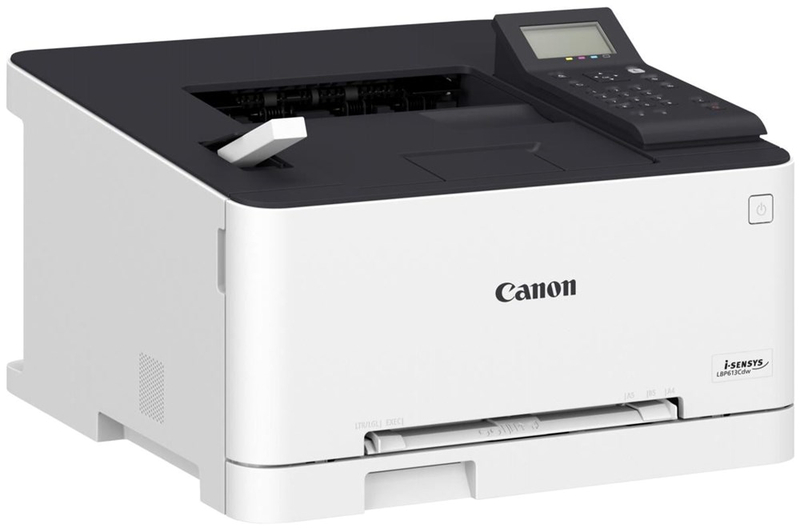 It is ISO Standard print speed (A4) up to 8.8ipm black / 5.0ipm colour, and comes with a hi-speed USB 2.0, making it the perfect refillable all-in-one ink tank printer with high volume printing at low running cost. MAXIFY MB5170 - A high performance business inkjet printer that supports mobile printing, cloud services, and easy network integration. 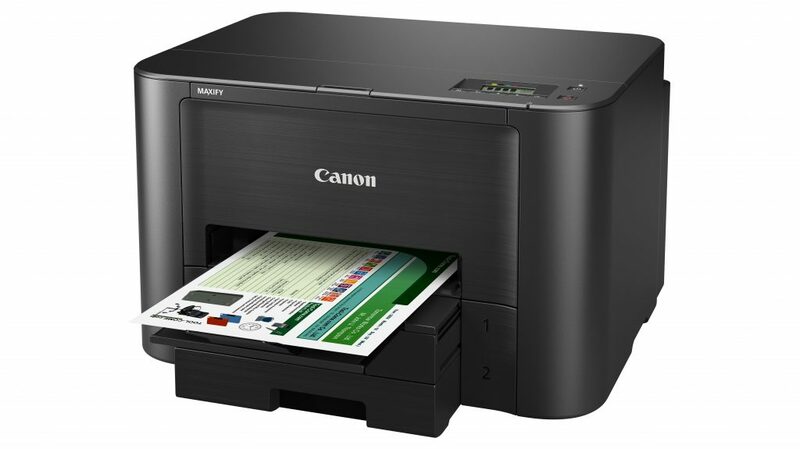 MAXIFY MB5470 - A high speed, high volume multi-function business printer with Wi-Fi and Ethernet connectivity, single pass two-sided scanning, and automatic double-sided printing. MAXIFY iB4170 - A basic yet reliable high speed, high volume business printer that will cater to all your printing demands. Purchase any printers from the iX series below and get a free PGI-750BK black ink worth RM68. PIXMA iX6870 - A high performance, ultra-compact A3 printer that comes with WiFi, wired LAN, and AirPrint. PIXMA iX6770 - High performance, ultra-compact A3 printer with 5-single inks. Purchase the PIXMA TS9570 and get a free PGI-780BK and CLI-781 CMYK Full Set Ink worth RM319. This A3 wireless compact Photo All-In-One printer combines amazing compactness and a wide range of printing features for complete home and small office printing experience. imageCLASS LBP613Cdw - Make great impression with vibrant colour printing from imageCLASS LBP613Cdw. 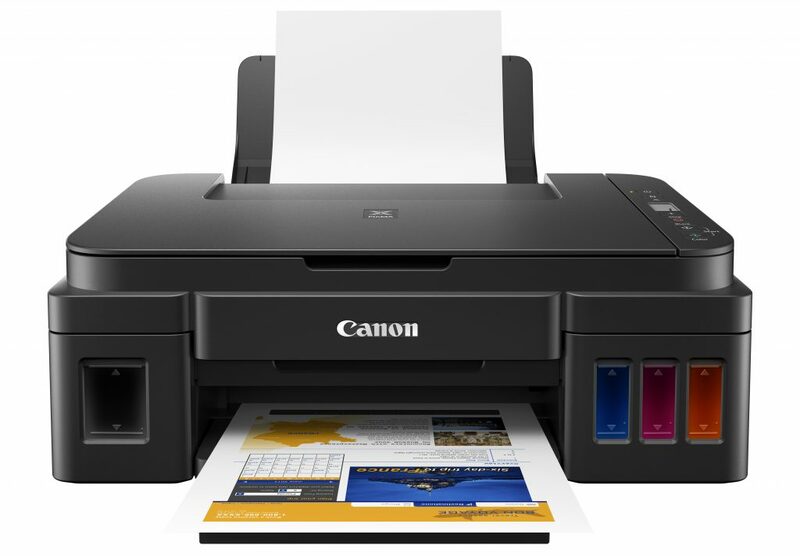 With swift print speed and automatic two-sided printing, it boosts productivity and work efficiency in the office. imageCLASS LBP611Cn - Create vivid colour printouts with imageCLASS LBP611Cn. The compact footprint and built-in network makes it an ideal choice for home offices and small businesses. So check out your nearest Canon Image Square outlet or authorised Canon dealer today. If you prefer to shop online, click here to see all the promotions on Canon's official website. It's like an Ipoh food trail all in one place!